The study by the National Audit Office (NAO) found that the Department for Work and Pensions is handing over £1.6bn over the next three years to private contractors who carry out the controversial health and disability assessments. But at the same time, the Government’s own financial watchdog has warned that savings in benefits payments are likely to be less than a billion pounds by 2020 as a result of the new tests. 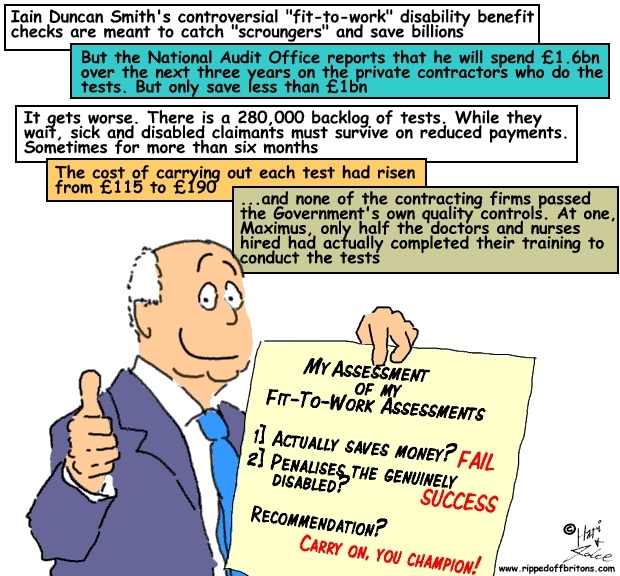 The NAO report also found: The cost of carrying out each employment and support allowance (ESA) test had risen from £115 to £190 after the controversial outsourcing firm Atos pulled out of its contract to run the tests last year; Benefit claimants are still waiting for more than six months before they are assessed during which time they are not entitled to full payments; None of the companies carrying out the tests met the Government’s own quality assessment threshold – with reports including spelling mistakes and unintelligible acronyms. The report found evidence that ministers set completely unrealistic targets for the number of ESA assessments that could be carried out each year. As a result, there is a backlog of at least 280,000 new claims while ministers have been forced to suspend plans to carry out periodic reassessments of those already claiming the benefit. The report also found significant problems with the American outsourcing company Maximus which took over the contract to carry out ESA assessments from Atos. Only half of all the doctors and nurses hired to carry out the assessments completed their training against a target of 95 per cent, while average staff costs rose from £26,000 in 2014 to £44,000 last year. Over the summer the company was carrying out just 37,000 face-to-face assessments a month compared with a target of 57,000. It had carried out 10,000 fewer paper assessments than it had promised the Government. As I'm sure many people have pointed out, the point of the WCA is not to save money, or not the primary point anyway. There is a centuries old tradition of making life miserable for the poor - ensuring that they have to work hard just to survive. One thing the idle rich cannot stand is idle poor people. Another thing these millionaire heirs and trustafarians cannot stand is anyone getting something for nothing. So no doubt the DWP will plough on with this punitive system designed to deny benefits to those who cannot work due to illness. Because this govt, much like the last two, cannot imagine just supporting people too ill to work without ensuring that their lives are miserable as well. Meanwhile tackling tax evasion would potential net 100x more in lost govt revenue, but that is continually resourced. Etc etc. BTW the WCA was not Iain Duncan Smith's idea. He inherited it from the last Labour Government. Assuredly he has pursued it in mad dog fashion, spending millions on "public relations" in the process, but he didn't think it up. He just implemented it. Labour ought to be held to account for their role in this as well. No way to STOP IDS and his very costly, hair-brained schemes?